After the offensive onslaught on Cinco de Mayo the Schlitz Gusto Guys came back down to reality. 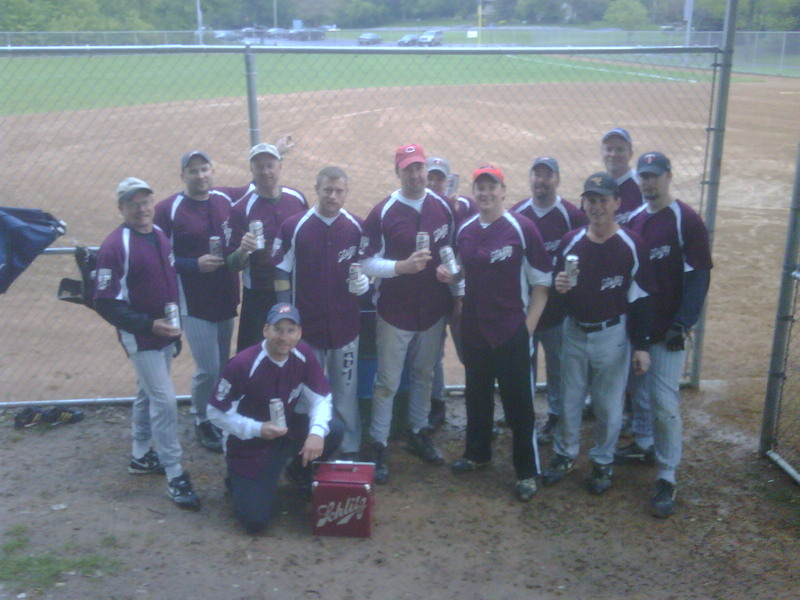 We played the top two teams in the elite Burnsville D/E Recreational league on 5/12/10 and we simply could not get it going. Even a Ferrari needs to stop for gas from time to time. The forecast called for upper 40’s and rain and thunder storms. It started raining by about 3pm. However, there was a never a fear of a rainout because we were playing two at SFRCMP (Skyline Fighting Red C*** Memorial Park). It simply does not rain on the Gusto Guys at SFRCMP. Numbers don’t lie. We did have a few compliments paid on our striking Schlitz uniforms. We also generously offered a “tall boy” to the opponents of Game #1, you know, to spread the love. Here’s to Schlitz and here’s to turning it around next week! I don’t know much, but I do know we have not lost a softball game in 2010 when Pub Krull starts off the night with a homerun. Numbers don’t lie. In Game #1, this trend came to a stop. The Schlitz Gusto Guys just couldn’t put any hits together. Luckily, CW legged out a groundball to the shortstop and the rest of the Gusto Guys moved him around the bases to manufacture our only run of the game. This game simply lacked enthusiasm, hits and “Gusto,” you know, the things that make up the Schlitz Gusto Guys on most nights. We had 12 leaders and a few of them only had one at-bat in this game. This game ended in about 25 minutes. Yuck, yuck and yuck. Last out: Brian Niehaus was forced out on a fielder’s choice. This has been a 15 year rule for the Schlitz Gusto Guys. Simply put, the last player out owes a 12-pack. We simply started where we left off in Game #1…Getting out, missing balls, etc. We did manage to put a few runs together and made a game of it. However, in the end we just didn’t have enough. I believe Pauly, Niehaus and Brain may have been the only three players with three hits for the evening. This is in contrast to all of the guys who had four or more hits last week. Fan of the night: Nary a fan on this cool evening. The Schlitz Gusto Guys did stick around and enjoy the refreshing taste of ice cold Schlitz (no cooler necessary on this evening), PER THE NORM! The good news is that the forecast for 5/19/10 is calling for upper 70’s and sun. That is usually the recipe for the Schlitz Gusto Guys to get back on track.